Tomorrow is National Wear Red Day to bring awareness to women's heart health. Heart disease is still the number one killer of women, so educating ourselves on nutrition and ways to take care of ourselves is more important than ever. There are all kinds of things that can be done to raise awareness to women's heart health and one of the easiest is to wear red today. I have a picked out my red sweater, black skirt, and red handbag for the day, and I am going to go out into the world and show my support. I am thinking about the ladies in my family who struggled with heart disease, like my mother in law who suffered a heart attack late last year, after years of dealing with heart related conditions. I'm wearing red for her. How about you? 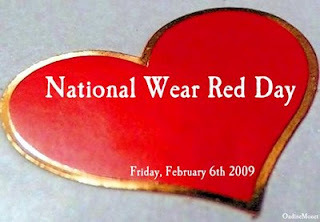 Will you wear red tomorrow?